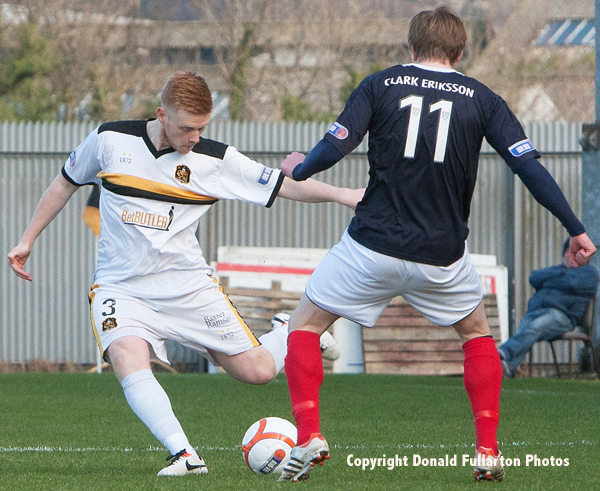 DUMBARTON began a run of three homes games with a 2-0 defeat at the hands of a young, eager Falkirk side. DUMBARTON began a run of three homes games with a 2-0 defeat at the hands of a young, eager Falkirk side, in front of a 1,000 crowd at the Bet Butler Stadium. The home side suffered two pre-match blows, striker Jim Lister calling off because of flu and new signing midfielder Nick Phinn being injured in the warm-up, and the patched-up side rarely looked as if they would trouble Steven Pressley's Bairns. Top strikers Lyle Taylor of Falkirk and Bryan Prunty both missed good chances in the early minutes. However the visitors were soon on top, and a fine Thomas Grant goal put them in front. Five minutes later David Weatherston gave them a 2-0 lead. It could have been more before the interval, but keeper Stephen Grindlay pulled off some fine stops. The home side were still ill at ease in what turned out to be a low key second half with no goals, failing to create chances for the front men. New signing Owen Ronald, son of former Sons skipper Paul Ronald, looked dangerous, as did Steve McDougall, but the well marshalled Bairns defence was not to be breeched. The picture shows on-loan Hibs defender Scott Smith making a clearance.